Looking for a New Jeep Renegade in your area? CarGurus has 2,409 nationwide Jeep Renegade dealers with 79,442 new car listings. 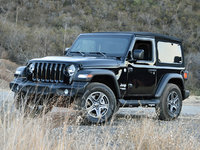 The Renegade, complete with rugged and off-road styling cues, is the Jeep’s smallest model. Introduced for 2015, the Renegade is a fairly fresh design and goes into 2018 largely unchanged— although a reversing camera has been added as standard equipment. The base model is called the Sport. Things move up from there with front-wheel-drive (FWD) standard and 4-wheel-drive (4WD) as an option for most trims, which include Latitude, Upland, Altitude, Limited, and Trailhawk. At the bottom end of the price spectrum, the 2018 Renegade still comes with a turbocharged 1.4-liter 4-cylinder that powers the front wheels. This engine comes standard with a 6-speed manual, and makes 160 horsepower and 184 pound-feet of torque. Another option is the larger, naturally aspirated 2.4-liter 4-cylinder that makes 180 hp and 175 lb-ft of torque through a 9-speed automatic. The smaller turbo engine manages 24 mpg city, 31 highway, and 26 combined, while the 2.4-liter unit is rated at 22, 30, and 25 with front-drive and 21, 29, and 24 with all-wheel drive. Jeep’s Selec-Terrain all-wheel-drive (AWD) system starts out with the engine driving all four wheels before cutting out the rear wheels once the Renegade is up to speed and only putting rear-wheel power back in when traction is lost. For those who want to spend a little time off the pavement and don’t want to commit to a Wrangler, the Renegade can be outfitted as a competent off-roader. The most dedicated model is aptly named Trailhawk, which has more ground clearance, skid plates, special bumpers, and a “Rock” setting for the traction control. The Renegade has a smaller cabin, with the backseat reportedly being on the tight side. Space in the rear cargo area measures a fairly impressive 18.5 cubic feet. With the rear seats folded, cargo space expands to 50.8 cubic feet. All 2018 Renegades come standard with 12-volt power outlets front and rear, a four-speaker stereo, height-adjustable cargo floor, and keyless entry. The Latitude model adds a 7.0-inch touchscreen, while the Limited adds keyless ignition, a better stereo, power-heated front seats, an 8.4-inch touchscreen, and leather upholstery. Other options include WiFi, cruise control, and a removable dual-pane glass sunroof. 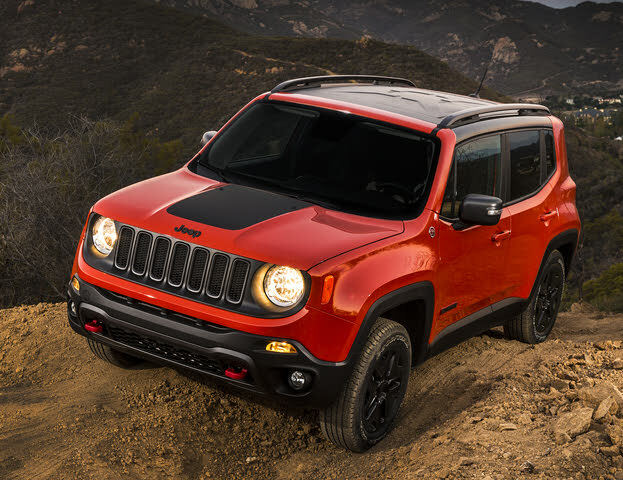 In crash tests, the Renegade has gotten top scores from the Insurance Institute for Highway Safety (IIHS), with the exception of its headlights. The National Highway Traffic Safety Administration (NHTSA), meanwhile, gives it four out of five stars overall. The Renegade can be ordered with forward-collision warning, automatic emergency braking, blind-spot monitors and lane-departure warning. What's your take on the 2018 Jeep Renegade? Users ranked 2018 Jeep Renegade against other cars which they drove/owned. Each ranking was based on 9 categories. Here is the summary of top rankings. Have you driven a 2018 Jeep Renegade? Enter your zip to see incentives for a new Renegade in your area. CarGurus has 34,821 nationwide Renegade listings starting at $9,499. Is The Renegade A Quality Vehicle?